Free Shipping Included! Roswheel 14686 Expedition Series Bike Rear Rack Bag Bicycle Double Panniers Cargo Trunk Bag by Roswheel at Joes V Cycle. MPN: 14686-G. Hurry! Limited time offer. Offer valid only while supplies last. Roswheel 14686-G expedition double panniers is a perfect carrying pannier for long journey touring, daily grocery shopping or commuting riding. 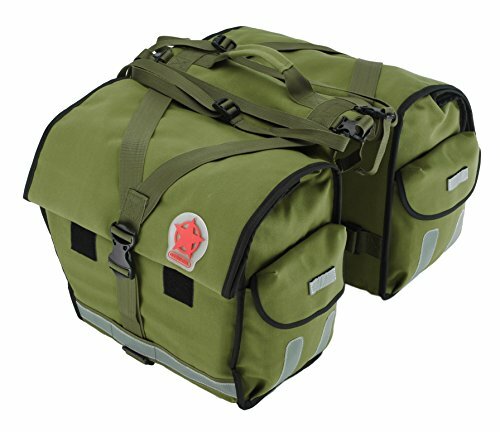 Roswheel 14686-G expedition double panniers is a perfect carrying pannier for long journey touring, daily grocery shopping or commuting riding. 1. High capacity: up to 13 gallons (50 Liters). 2. Structured by 2 main compartments with 2 rear pockets. 4. Y-shaped fastening system ensures firm and tight loading. 5. Good water proof performance. 6. Roll-top closure makes the bag in compact shape to fit the rack. MATERIALS: made of high quality Retro canvas with PU Coating and 600D polyester material as lining. Sturdy, durable and good performance of tear resistance, abrasion resistance and water resistance. Built-in PE board for keeping the bag in good shape and better protection. ADJUSTABLE CAPACITY: roll-top closure adopted, the adjustable capacity up to 13 gallon (about 50L), the maximum loading capacity 130 pounds. Two adjustable belts on top allow more loading. INSTALLATION: tool free installation, using three buckles with adjustable belts and two widen Velcro straps to fix bag to the rack securely. UNIVERSAL FIT: suits for most of bike racks. BETTER SAFETY: 2 big reflective logos on the two sides of bag for extra safety when riding in the dark or in reduced visibility.